I’m sitting on the terrace of a cafe in Puerto Ayora, watching fishermen unloading on the docks below. Beside them, a young sea lion rises high in the water, eyeing up the day’s expansive catch of hulking yellowfin tuna. 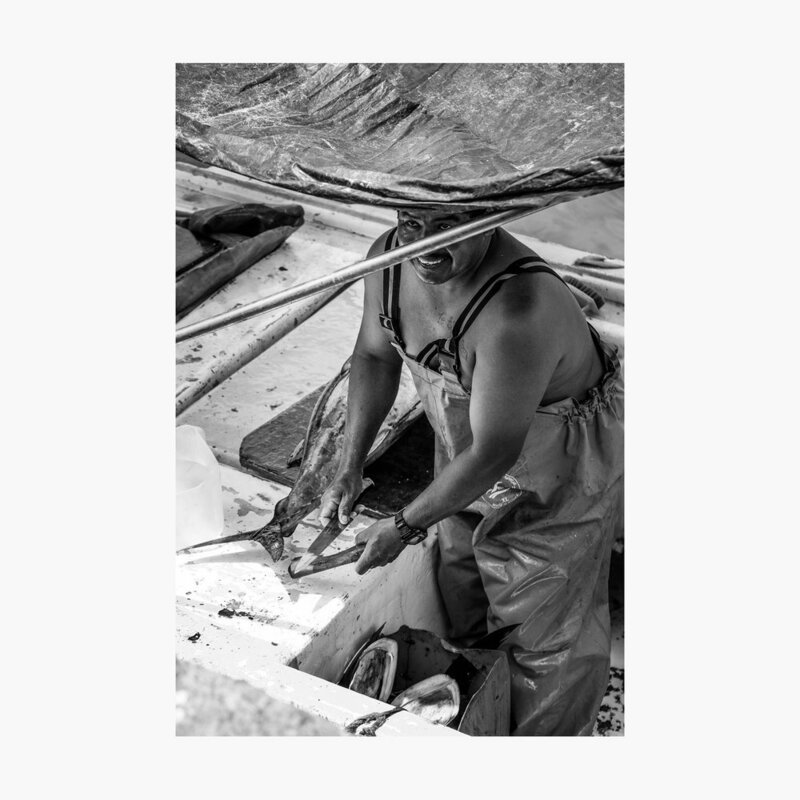 A woman from a local restaurant struggles from the boat with one of the tuna fish, now headless after a swift slice from a sharp blade. Its body is as long as her torso, its weight seen in her short, shuffling steps and bow-legged stance. Her arms and hands strain at the tightly gripped shoulder and tail. It would make a fantastic photograph. The fishing boat is surrounded by a flock of hungry pelicans jostling for position. Several are lined up on the dockside like a naval parade. A few try their luck on the deck, a dozen more in the water. I watch as the sea lion gets among them. He reaches up and sniffs at the preparation deck as the two fishermen weigh and divide their catch. Stretches high, edges closer. Too close. He’s shooed away like a dog from the dinner table, rolling backwards with all the verve and character of a juvenile. The scene will play out again, I’m sure. But I’ll need to be quick. It’s time to abandon my coffee and pick up my camera. I’m down by the dock moments later, surrounded by a cluster of trucks and traders. People busy taking stock and checking their quota. It’s a small enterprise, a single wooden fishing boat, tattered plastic canopy flapping loose on the breeze, draped over a basic scaffold and stained with the signs of seabirds. On the boat, immense chunks of flesh are rapidly divided into quivering prime cuts. The preparation area is rough, the wood aged, panels from an old wooden crate serving as chopping boards. The day’s catch is hidden below in deep ice chests and hefted out one by one, a pair each time. Great glistening curves of silver, tipped with acid-yellow at their extremities. The fish is washed down with sea-water; a battered kitchen bowl for one fisherman, a cut-down plastic jug for the other. Every time a vessel is rinsed the lone sea lion and flock of pelicans advance with enthusiasm in case there’s a fishy morsel to spare. There is one. On the deck is a fat, gaping fish head resting beneath the great frame of a man. A man who moves with the steady experience of Captain. He’s dressed only in his waterproof dungarees, cyan blue and stained with crimson. Black and yellow braces sit loosely over his considerable chest and broad shoulders. Hair and skin dark. A tattoo in cursive script where a shirt pocket would be. We make eye contact now and then, and he has an easy warmth in those eyes, a flicker of intensity. His second in command works in silence opposite, and they go about weighing, pricing and dividing the catch with practised efficiency. Both men wear a light sheen of sweat from their work. Prime cuts are casually bagged in black plastic and then hefted off by various suppliers or restauranteurs. Occasionally the watching animals get rewarded for their patience; occasionally they lose patience and make a desperate lunge for the enticing cuts. In my last piece, I swapped street photography for sandy beaches. I’m still on the Galápagos Islands today, but this feels more like Billingsgate Fish Market in macro. 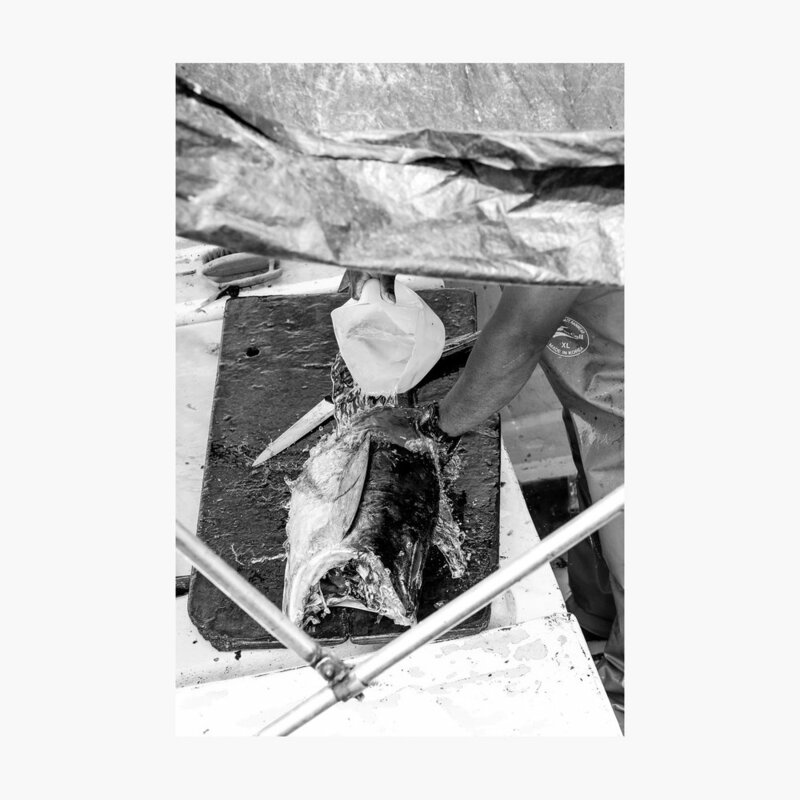 The freshest of fish being weighed, divided, and distributed within moments of arriving dockside. There’s a buzz reminiscent of the city. A touch of the frenetic energy street photographers crave, slowed down a little for island life. Most of the local traders have noticed me snapping away. I sense bemused conversation all around me—the inquisitive tourist—but the smiles keep coming and no one objects to my lens. As far as I can tell. My Spanish is far from perfect. There’s the flick of a knife through forgiving flesh. The sprinkling of water to wash away blood and offal. Fresh tuna steaks passed between men. Steel against stone as knives are sharpened. Yellow, turquoise, and silver accent colours. Wildlife falling in and out of focus. Skilled hands making quick work of a hefty catch. What I really want to capture is the interplay been animals and men, it’s a scene packed full of characters like a classic Disney movie. It brings to mind Snow White in the woods with the wildlife. It’s a tall order with the XF56. I really should be shooting with something wider. But I persist all the same. I decide to get a different angle and jog to the opposite arm of the dock, dodging cars and collectivos, to better catch the boat being surrounded by advancing pelicans. My new position displaces a juvenile marine iguana. It scuttles away behind me. I refocus and fire off several shots of the voracious seabirds. Once again, I catch the eye of the captain, even now from afar. To my surprise he gestures to me, mimes taking more photographs and points to the bow of the boat. I point back for confirmation and he beckons me over again with a nod of the head, a smile, and I imagine, a si amigo. I descend the wet, stone steps of the dock with care and hop onto the bobbing deck of the narrow boat. Blue paint chipped and textured with the scars of life at sea. I’m not quite sure what the deal is, or the advantage of being onboard at the bow of the boat (when I was already within touching distance of the crew dockside), but I’m snapping away at the opportunity regardless. Until, that is, we're untethered from the dock by the crew. We’re floating freely. The engines start up. There’s a moment of mild panic at this point. I’m due to catch a boat to a neighbouring island at one-thirty, in a few brief hours, already booked and paid for; the last of the day. I’ve left my friend, Katie, in the cafe with our bags. Without any knowledge of my unexpected departure. And I fear I’m about to sail out to sea. I call up to Katie, hoping she can hear me from the terrace. My cries become louder with each call, desperation more acute as we drift away. She eventually catches on, spots the events unfolding, and gives me a look as if to say “What on earth?” (Or perhaps, WTF). I shrug and raise my hands in response. What can I do? I wave goodbye, she waves back, gives me a nervous little grimace, and returns to her coffee. A young crew-member sits on the bulkhead, his legs dangling. A man wearing a t-shirt with Tommy Hilfiger written across the chest sits beside me. There’s an air of management about him. Tommy gives me the impression he’s discussing prices and payment for this unexpected trip, but I quickly loose track of the conversation speeding by in Spanish. I’m mostly baffled and confused by the turn of events and my limited translations fail to clarify the situation. So I simply smile, nod, and continue to snap away. I ask Tommy about timings and believe he says we’ll return at midday, which abates my fears. A little at least. I have no idea if we’re off for a quick tour of the harbour or heading out to sea for an afternoon’s fishing. First, we sail across the dock to some neighbouring boats and a couple of the crew hop off. Perhaps the day’s work is complete after all. It looks like we might park up, tethered to the raft of water-taxis and fishing vessels that ebb and flow in front of me. I begin to wonder if it’s all a misunderstanding. Until, passengers departed, we back up and turn towards the open ocean. But the adventure is not to be. The image of wrestling with nets and lines on the high seas evaporates with the heat. We only return to our mooring at the dock and once again lay anchor. There’s a moment of calm and quiet. Then the fishermen resume their work on the yellowfin. I move back to dry land, lest the crew suddenly change their minds. I’ve well and truly disturbed the scene, despite everyone continuing as if I'm not there. But I’ve also exhausted the angles, and so I decide to make a quiet exit. Before I return to the cafe, I head to the local mini market. I buy some cold beers for the crew. Cervezas shared in the sun, I say my goodbyes. As I resume my place on the terrace I wonder what could have been. Joining a fishing boat at sea would be something special, no doubt delivering a wonderful set of photographs. But I also take in my experience on the docks. I’m reminded of the importance not to shy away from a shot. You never know what opportunities may emerge. There’s a natural fear in photographers—especially so when starting out—of raising the camera on a foreign scene or a complete stranger. Fear of rebuke or retaliation, most often. But unless you’re paparazzi, your intentions should only be good ones, so getting over that fear is crucial, and getting that across is paramount. Going in relaxed and friendly and smiling puts people at ease. Makes photographs flow freely. It’s a valuable attribute for street. If this was a planned documentary shoot, those shared beers and a chat with the subjects might have happened before I got started. The time prior spent only as an observer, getting to know the fishermen. Better understanding what they do. Allowing them to relax in my presence, and in the presence of a camera. But being an impromptu shoot, beginning with street photography, I had to reassure them through the way I went about capturing their photographs. Nothing to see here, just a tourist enjoying himself. Of course the boundaries between disciplines were somewhat blurred in this instance, but the principles ring true. Very often, street photography is an art in putting people at ease. It’s a slight of hand: I’m not taking your picture, I just happen to be passing with a camera; I’m much more interested in what’s behind you. As my watch ticks around to twelve, I’m pulled from my thoughts by the crew calling up to the terrace; they gesture to join them once again. They’re off out to sea after all. Midday wasn’t the return time, it was the moment we would set off. With a heavy heart I tap my watch in the universal signal for ‘no time’ and they nod in acknowledgement. Wave goodbye. I watch them boarding the boat and setting sail, considering the photo opportunities. Itching to join. But I'm also content with my unexpected experience. After all, it’s not often you step right into the scene itself. You can see this project in full and in large format in the Series section of my website: The Fishermen. If you enjoyed this post or have any questions, please like, share or leave a comment below (no signup required), thank you.